How a motley crew set out to save Monroe Mountain's white-barked beauties. Seven years ago, Fishlake National Forest Richfield District Ranger Jason Kling had a whole mountain of aspen in trouble. Monroe Mountain, a sky island in south-central Utah, rises more than a vertical mile above the surrounding valleys, reaching a height of 11,227 feet. For thousands of years, vast stands of aspen have blanketed the mountain's upper flanks and high volcanic plateau. But aspen in Utah face two main hurdles. From above, taller spruce, fir, and other conifers overtop aspen, depriving them of sunlight, while from below domestic cattle and sheep, and wild elk and deer, eat tender young aspen sprouts before they have the chance to grow up into trees. Without new recruits, entire stands of aspen age, fall over, and die out. The aspen on Monroe Mountain face both problems. Without low-intensity wildfires to thin them, fir, spruce, and other conifers have taken over, overtopping two thirds of the mountain’s aspen. At the same time, livestock and large numbers of elk and deer are decimating the sprouts, especially where aspen growing separate from conifers are easily accessed. Kling and the Forest Service had been focusing on the conifer problem, while largely avoiding the grazing problem, because, while the Forest Service manages livestock on the Fishlake National Forest, the state of Utah manages elk and deer. But to save the mountain’s aspen, Kling had to tackle both issues, and he knew it. An earlier attempt to restore aspen had failed because everyone with a stake in what happens on Monroe Mountain couldn’t agree on how to go about it. Aspen has a lot to offer the mountain. From a conservation perspective, aspen is second only to riparian areas in terms of the number of wildlife and plant species that call it home, or visit or nest there. Because so many plants flourish in the understory, livestock and wild animals congregate there to graze. In the fall, people travel from all over to see the aspen leaves glow gold. Everyone could agree that restoring aspen was important, but how would we go about it? To answer that question, in 2010, the Utah Forests Restoration Working Group, which included local, state, and federal agencies, academics, and representatives of hunting and conservation groups (including the Grand Canyon Trust), published Guidelines for Aspen Restoration on the National Forests in Utah. But would these guidelines actually work? By early 2011, the Trust and the Utah Department of Agriculture and Food's Grazing Improvement Program, which advises and supports livestock ranchers, had co-convened the Monroe Mountain Working Group to find out. With 19 members, the group brought a wide variety of viewpoints to the table, including representatives of livestock owners, hunting organizations, private landowners, Utah counties, and a forest service scientist, all working together to restore aspen on Monroe Mountain using the new guidelines. Skilled facilitator Steven Daniels of Utah State University made sure no one was lost in the group, which committed to making all decisions by consensus. There would no minority of majority votes. Everyone had to agree. Cheerful and absolutely neutral, Professor Daniels has a way of keeping everyone positively engaged. Early on, the group spent three days traveling and camping together throughout Monroe Mountain, looking at dozens of aspen stands. Some stands were doing well after prescribed fires. Others had been lost post-fire when deer, elk, cattle, and/or sheep decimated all the newly emerging sprouts or reduced to a few scattered old aspen with no conifers present. Still others had been overtopped and shaded out by conifers. “I’ll never look at aspen the same way,” Vince Pace, long-time Monroe Mountain range specialist, remarked after the trip. The group tallied up the challenges: too many years of fire suppression; numerous private inholdings where private landowners worried controlled burns might jump onto their property; potential wilderness areas where thinning conifers is more complicated; and excessive browsing by cattle, elk, deer, and sheep. But still, the basic premise remained: Everyone wanted aspen to have a chance on the mountain. Who was the main culprit devouring aspen sprouts before they could mature: cattle, or elk? To find out, the group set up five 100-foot transects in aspen stands without many conifers (called persistent aspen). 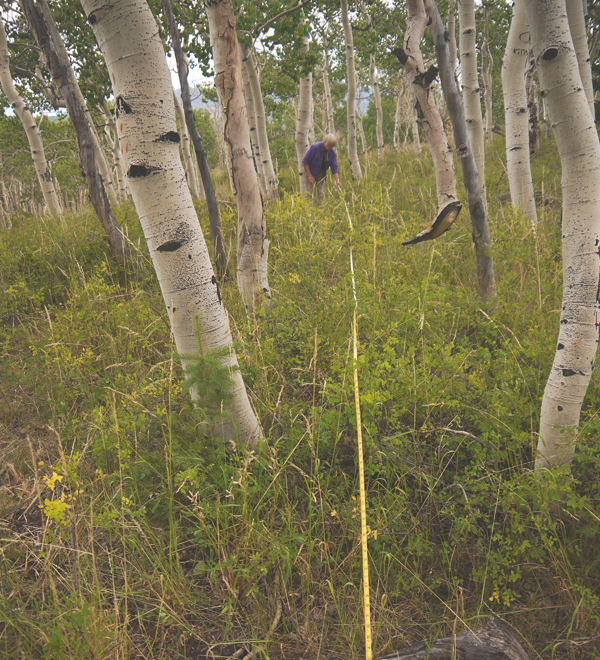 A careful process, each transect entailed extending a tape measure for 100 feet in a straight line, and then measuring and recording the number and height of aspen under six feet tall (roughly the height an elk's mouth can reach) within three feet on either side of the tape measure. It was also important to document whether or not the top of the aspen had been bitten off, preventing the aspen from growing taller. Aspen shoots send up "leaders." If the leader is bitten off, the aspen must regrow a new one before it can continue its upward growth. In areas where aspen is heavily browsed, it's not unusual to see aspen that look more like bushes, with trees that may be 15 or 20 years old barely two feet tall, as the result of their leaders being repeatedly browsed by animals. The group placed wildlife cameras at each end, and traveled to the transects seven times in one year to measure when the aspen were being browsed. The cameras gave the group its answer: Cattle, elk, and deer were all eating aspen. What about sheep, you ask? Well, none of the transects were in areas where sheep grazed. Now that we knew who the culprits were, the group began asking questions about wildlife and livestock population trends over the years. Utah Grazing Improvement Program and Utah Division of Wildlife Resources representatives teamed up to compare populations on the mountain over the last century — from 1910 through 2010 — and to estimate how much different species were eating in a month. This monthly consumption by species is calculated using a unit called “animal unit month,” or AUM for short. Sheep and cattle AUMs have declined since 1910, while deer numbers peaked in the 1960s and then declined. Elk were introduced in the 1980s. The result? the number of hoofed animal AUMs in 2010 were approximately as high as in the 1920s, and fairly equally distributed among cattle, elk, and deer. An aspen sprout shooting up just two weeks after a prescribed fire. Around this time, the Monroe Mountain Working Group learned of a Brigham Young University (BYU) professor, Sam St. Clair, interested in the fate of persistent aspen as well as aspen regenerating after prescribed fires in areas where aspen are mixed with conifers (called seral aspen). As luck would have it, one of St. Clair’s doctoral students, Aaron Rhodes, was willing to commit the next five years of his life to establishing and measuring aspen height and browse levels along 30-meter-long transects of persistent aspen at 63 sites across Monroe Mountain. Rhodes also set up three four-way exclosures (areas where fences of different heights exclude certain types of browsing animals so that you can pinpoint who is doing what amount of browsing) in post-fire seral aspen stands, and established new transects in areas after fires had passed through. With funding from the Forest Service and other members of the Monroe Mountain Working Group, a large amount of research was begun, and continues today, all aimed at answering questions of mutual interest to the BYU researchers, the working group, and the Richfield Ranger District of Fishlake National Forest, overseen by District Ranger Jason Kling. Other questions arose. How long have some persistent aspen stands gone with all their sprouts being browsed off? Twenty-one Whitman College students led by the Trust cut down three of the youngest trees in 100 aspen stands, carefully labeling a three-inch slice from each tree. Stan Kitchen of the Forest Service Rocky Mountain Research Station and a Monroe Mountain Working Group member, counted the rings of each of those 300 slices. The results were astounding. In some stands, no sprouts had made it above browse height to replace older aspen stems in decades. Some stands hadn't managed to "recruit" sprouts into the overstory in 40 to 90 years, with one of the hardest hit stands unable to recruit any new stems in 139 years. If a stand can’t recruit aspens sprouts to grow into trees, a stand will die out after 150 to 200 years. After years of study, research, and data-gathering, in 2015, an environmental impact statement that considered recommendations on all aspects of aspen restoration gave the green light to the 10-year aspen restoration project on Monroe Mountain to finally undertake the burning, thinning, fencing, and other measures to protect aspen. What about Jason Kling’s need to get help from the state to manage the elk and deer? The Utah Division of Wildlife Resources has agreed to undertake an emergency hunt near post-fire aspen sprouts if they are being browsed beyond a pre-determined percent. And the private inholdings? Many of the landowners are agreeing to accept state help thinning conifers on their own property, reducing the risk of catastrophic wildfire and relieving the Fishlake National Forest of the burden of being the only entity to protect their property during fire. Volunteers Vera Markgraf, Gisela Kluwin, Lindsay Trudeau, and Mimi Trudeau, after completing the last of three years of painstaking aspen understory transects. What about plants beneath the aspen? The Trust agreed to identify all grasses, wildflowers, and shrubs along the 63 aspen transects Aaron Rhodes had established. Three years in a row, highly skilled Trust volunteers spent a week identifying the plants, sometimes with only an inch of stubble remaining from which to identify the species. Successful prescribed fires were completed in 2016 and 2017. And some successful fires have already been completed in 2018. Six areas totaling 240 acres were set up to exclude cattle and sheep, thus allowing us to estimate the proportion of aspen being browsed by elk and deer alone. But not all is on a trajectory of restoration. Boreal toads, for instance, appear to be disappearing from the mountain due to chytrid fungus. Patches of old persistent aspen appear highly vulnerable to even modest browsing, and they could be lost unless protected. The most common species found under the aspen on the mountain these days are not native plants, but non-native dandelion and Kentucky bluegrass. Boreal toads are disappearing from the mountain. Future restoration is not certain. But if there is hope for solving these and other problems, it lies in the continued willingness of the Monroe Mountain Working Group, the Richfield Ranger District, and the Forest Service, with facilitation help from Steven Daniels, to tackle challenges with candor and reach consensus-based decisions based on science. Seven years in, the Monroe Mountain Working Group continues to meet to track the results of restoring aspen on the mountain, and to monitor that work. Even when the members of the Monroe Mountain Working Group disagree, we’ve got work to do. It involves healthy debates. Facilitator Steven Daniels once asked what we most appreciated about the group. For me, it's the fact that whenever a question is asked about science, people are willing to address it with existing data, or to go out and collect new data to be able to answer it. This group is always open to science. During a recent meeting, we reconvened after a break and Daniels provided a short overview of the discussion thus far. "Now, I’m not a scientist. I don’t know what you all know," he said in his typically self-deprecating fashion. "So I’m going to try to summarize. You tell me if I have it wrong." In just a few minutes, he drew a flowchart, summarizing the issues so well that, when he finished, everyone applauded, and onward we went. Monroe Mountain Working Group facilitator Steven Daniels in action. In December 2017, District Ranger Jason Kling traveled to Washington D.C. to accept a Forest Service Chief’s Honor Award for Sustaining Our Nation’s Forests and Grasslands for the Monroe Mountain Aspen Ecosystem Restoration Project, one of only three such awards given nationally each year. The award description notes that "Obtaining public buy-in and collaborating with other agencies and stakeholders represents thoughtful leadership, the development of a long-term vision, and establishment of relationships." It goes on to call the collaborative approach that the Monroe Mountain Working Group embodies a "tremendous success." Two thousand miles west of the nation's capital, on Monroe Mountain, spring is arriving, with aspen budding and preparing to send up new shoots. The restoration work goes on and the message to the aspen of Monroe Mountain is clear: Take heart! Mary O’Brien directs the Trust’s Utah Forests Program. She has worked as a staff scientist within toxics reform, environmental law, and public lands conservation organizations for 34 years. Fishlake National Forest Richfield District Ranger Jason Kling among Monroe Mountain aspen coming back after the Box Creek Fire. Trust volunteer Vera Markgraf rolls out her measuring tape as part of an understory transect.